Certainly, excluding people and cannon, the most valuable pieces of a fife & drum corps are its collection of drums. Many corps' collections are years in building and include excellent examples of rare drums that are irreplaceable. Some corps feature truly ancient instruments, hundreds of years old, made to exacting standards by master craftsmen. If your collection of instruments is as varied and interesting as ours, you'll treat each drum as a treasure to be played often and with respect. Our most intensive efforts should be spent ensuring the safety and well-being of these works of art. The first item on drum maintenance is usually the most visible. From the drummer's perspective, drum heads represent the most viewed part of the drum, and they, by default, are maintained most frequently. When you damage a drum head either by misuse or structural defect resulting in the failure of the surface, it's replacement is critical in the performance of the drum (no-duh, Ken). Choosing when and with what to replace a head can be an emotional debate. Natural or Not. Each material has it's advantages and disadvantages. In addition, each manufacturer has a wide selection of items from which to choose replacements. In general, buy natural and tuck them yourselves or get them pre-formed, but if you are pressed for time and money, feel free to use any head that fits! Natural heads have one distinct advantage, they're natural ;-). This results in a richness of sound and authentic look that accents the performance of the drum. Maintenance on natural heads is no more than occasional inspection and care during use to avoid soaking in wet weather. Of course, we all get wet once in a while. Another drawback to natural heads is the price. Checkout some online drum sellers prices, for example: Heritage Drum Company offers skin heads for over a hundred dollars on a new drum. These are for first class heads, professionally tucked by an expert. At $50 each, caution must be used when marching with these heads. Of course, if you are careful, they will last for years. If your natural head gets soaked, the best course of action is to loosen the ears of the drum and place the drum in a dry and well ventilated area for gradual drying, of course you can not play the drum while it's wet as soaked skin tears like paper. Dry too fast, you may tear the skin by flaking it, dry too slow and mold and mildew take hold and weaken the skin. Too fast is usually a matter of minutes, and too slow is several days. Any length of time from a few hours to a day is usually safe. Occasional inspection of natural heads is required to verify that no hairs or rips threaten to cause fractures. As a natural head reaches the end of it's functional life, you should prepare a replacement by either tucking a new one in a new flesh hoop or purchasing a new one pre- manufactured. Be sure to examine the old flesh hoop and determine if the hoop is sufficiently straight for possible recycling. Plastic heads have the distinct advantage of being water proof. The texture and tone of your drum doesn't change in a thunderstorm. Plastic heads are almost always less expensive than leather, and are more readily obtained as well. I can acquire several types of plastic heads from any local music store in price ranges from $5 to $25 based on size and model. Fiberskin and Legacy heads look and sound great, but are difficult to find. Any Remo batter head should work just fine. The largest problem with plastic heads is the sound. I have a hard time tuning the ring out of a plastic head, but you may know someone that doesn't have this problem, and considers plastic heads as good as natural. The key here is requirement to play in the rain. Snare side heads have the luxury of being out of the public eye, and often you'll see a substandard head on the bottom of an otherwise perfect drum. Unless you set your drum on a fire hydrant, the bottom head is almost always installed and forgotten about. You can mix and match heads top and bottom, leather and plastic but be prepared for unbalanced stretching and frequent fine tuning as one head stretches and the other doesn't. Generally, the bottom head is a thin clear plastic head or as fine a leather head as you can find. In the pictures above, you'll notice that one picture features a pig tail knot with nice bright white rope, and the other an ear threaded through with a yucky yellow rope which looks almost finished. Believe it or not, those are pictures of the same drum, in different lighting, and the drum on the left has the same clean rope as the one on the right. In the event that your once bright rope has dulled and otherwise changed color, you should realize that the rope has also weakened, and should be replaced. Of course, if your rope started out a natural hemp color, closer inspection will be required to determine it's strength. When purchasing new rope, you can buy pre-tied lengths which feature a loop at one end an a functional tape wrap at the other, purchase a whole spool of rope from Florance-Drums, Cooperman or Old Glory, or you can head down to your local hardware store and purchase lengths of cotton rope (which will stretch for the next ten years, so avoid this practice). If you buy spooled rope, you'll need to figure out a method of anchoring one end to the other when the lacing is completed. A simple and effective method of creating a loop is to unwrap the last inch of rope, and then braid it back into the rope two inches from the end. Some sort of binding agent (i.e. super glue) should be used to ensure a tight bind with the newly formed loop. If you are replacing your rope, the easiest way to remove the old rope is to use a pair of scissors (carefully, now) and just cut it off. Of course, this leaves several dozen three foot lengths of rope to dispose of... If you take the time to unwrap the drum you'll save the rope from further damage and possibly allow the recycling of the rope on a different drum or a clothes line. Ears are a conspicuous addition to your drum. You use them every time you use your drum (hopefully) and their care is almost as important as any other component. Ears generally consist of a piece of folded leather pierced with two holes and laced with leather strapping. The leather strap is tied under the ear and effectively holds the shape of the ear. Our ears are almost all rectangular leather about 1/4 thick cut so the ends are rounded over. The holes are punched using either a drill and 1/8 bit or a leather punch. The leather strapping is just leather shoe lace purchased at the local grocery store. If you find an ear needing new leather (as the ears themselves are almost indestructible) simply turn the ear so it stands perpendicular to the barrel and cut the old leather free. Take the new strap and feed both ends at the same time through the ear from the face to the back. The face is the half of the strap that faces the world and the back faces the barrel. Take the length of strap and pull it tight, taking each end and wrapping them around the outside and feeding them back through the original two holes. Simply tie together the two resulting ends and cut to length. Our ears feature a decorative star pattern punched in the face. This is amazingly easy to accomplish. Purchase a star leather tool at your favorite leather supply company and simply hammer the shape into the leather with a single good whack. An often overlooked problem with snare and bass drums is the hoops. 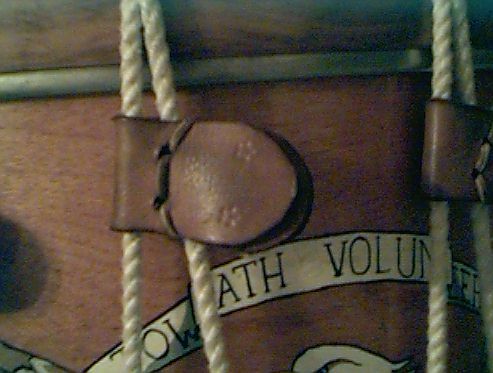 These pieces of wood are the focus of the stress applied by the ropes, and are the instrument by which that stress is passed onto the drum heads. Hoops often fail, but are seldom replaced. That means there are a large number of improperly functioning hoops on the streets. One thing a hoop is _not_ supposed to do is touch the snares on the bottom head of a snare drum. If the snare chanel is cut too shallow, and the bottom head is stretched too much, your bottom hoop will choke off your snares and make tuning your drum impossible. In the below picture, youll see a very clear gap where the snare tensioner meets the bottom hoop (by the cat's head). This gap should appear on the snare anchor side of the drum as well. Another thing a hoop is not supposed to do is break moments before a parade, or worse, in the middle of one! Close inspection of the hoops will probably reveal fractures around any stress points like the rope holes or snare chanels. In the above picture, you can clearly see that the snare chanel is also the joint for the hoop, a double possibility for a point of failure. One more problem is a poorly alligned hoop or one that is warped beyond function. If your hoop fails, the pressure it is supposed to absorb and spread is transfered directly to your heads in small areas, resulting in increased head problems, like splits along the circumpherence. Fortunately counter hoops are inexpensive and readily replaced.